Flight VA246 will be performed from Ariane Launch Complex No. 3 (ELA 3) in Kourou, French Guiana. 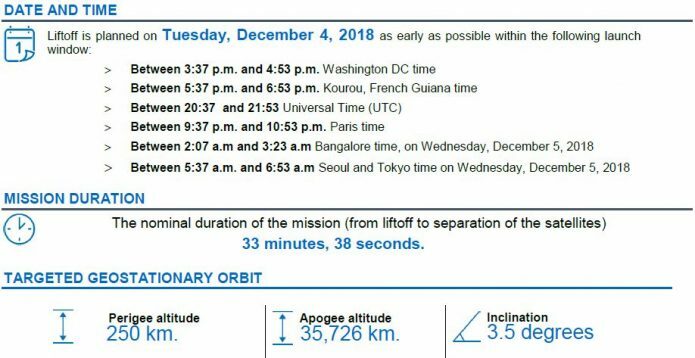 The Launch Readiness Review (LRR) will take place on Monday, December 3, 2018 in Kourou to authorize the start of operations for the final countdown. To be installed as Ariane 5’s upper passenger, GSAT-11 is an operational telecommunication satellite designed and manufactured by ISRO. To be positioned at 74° East, GSAT-11 ̶ ISRO’s largest and heaviest communication satellite ever ̶ is configured on its next-generation I-6K structure to provide communications services from geostationary orbit in Ku- and Ka-bands in both forward and return links. With two ISRO’s additional satellites remaining in Arianespace’s order book (GSAT-31 and GSAT-30), the launch of GSAT-11 is to be another vivid demonstration of the strong bond uniting Europe and India in space cooperation. Positioned on Ariane 5 as Flight VA246’s lower passenger, GEO-KOMPSAT-2A is designed to conduct meteorological and space weather monitoring missions whereas GEO-KOMPSAT-2B is to carry out Earth environment monitoring and ocean monitoring missions. 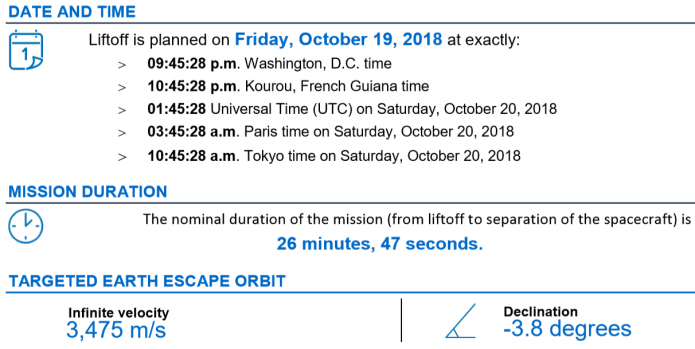 Covering the Asia-Pacific region, this weather satellite will be stationed at the 128.2° East orbital location for a 10-year nominal life in service. Developed by KARI at its facility in Daejeon, South-Korea, GEO-KOMPSAT-2A will be KARI’s second satellite, and the seventh for South-Korea to be lofted by Arianespace. GSAT-11 and GEO-KOMPSAT-2A will be the 589th and 590th satellites to be orbited by Arianespace. To watch a live, high-speed online transmission of the launch (including commentary in French and English from the launch site), go to arianespace.com or to youtube.com/arianespace on December 4, 2018, beginning 20 minutes before liftoff.